For two in our group the pain arrives soon in the shape of blisters from ill-fitting boots. Fortunately I have comfortable shoes. My particular anguish stems from the abrupt shift from being fairly sedentary to being super active. Hiking the Larapinta Trail definitely takes me out of my comfort zone. And that’s a good thing. 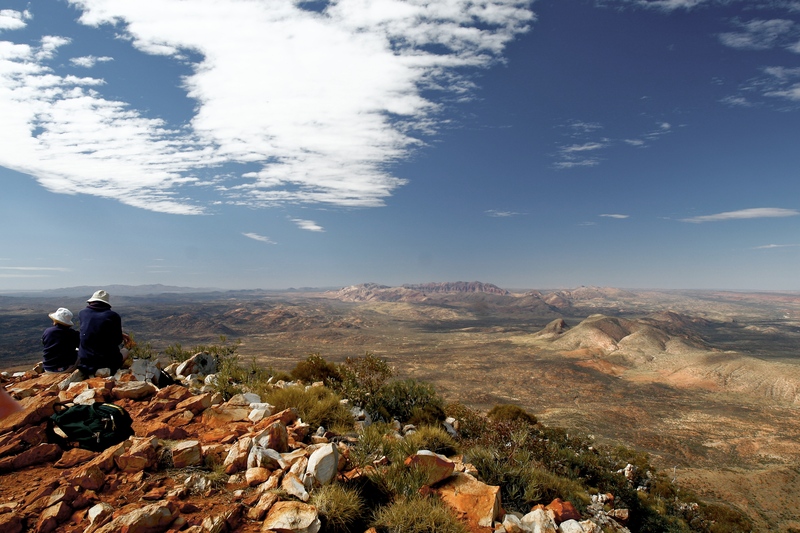 It’s hard-baked ground in the vast MacDonnell Ranges west of Alice Springs, a sunburnt, cracked earth covered in mulga scrub, broken red rock and scree. Australia’s raw heart is a forbidding land of awesome proportion and isolation yet also a place of incredible beauty. 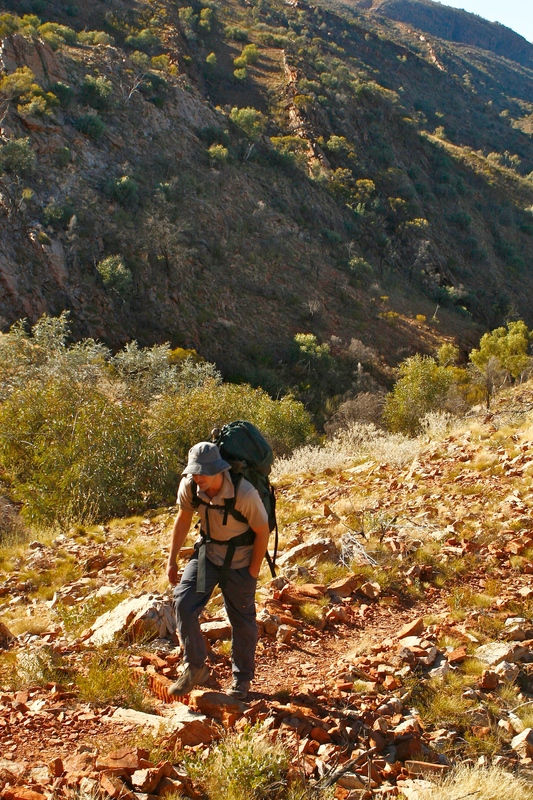 The 232-km Larapinta Trail snakes across this tortuous terrain of wind-scoured broiled stone. It follows narrow spurs flanking precipitous gorges and winds its way up steep slopes that are littered with massive boulders. The highest point, Mt Sonder, proves to be both the toughest climb and highlight of our four-day hike along sections of the trail. 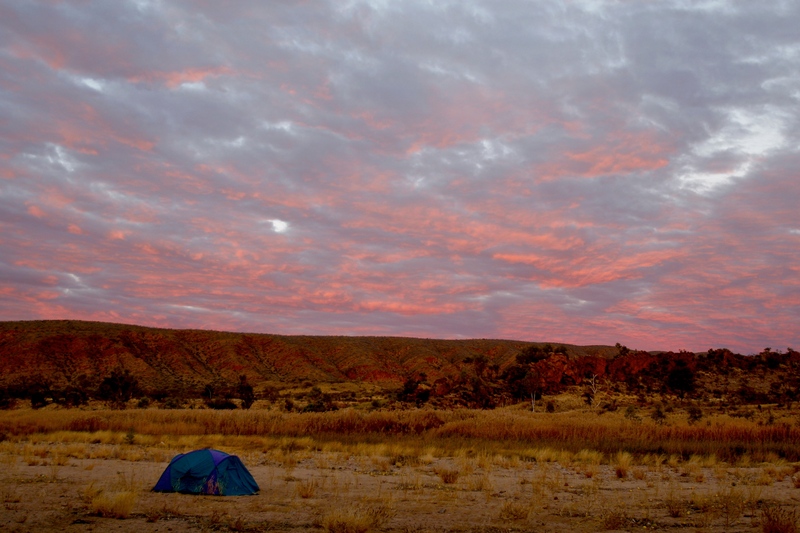 One freezing night is spent in swags flung between ghostly river gums along the dry bed of the Hugh River. Another night I’m soaked in a desert storm despite ducking for cover when the rain arrives. Within moments I have sleeping bag and swag in a tangle and have brushed against all sides of my tiny tent which immediately starts to leak like a sieve. Each day spent trekking through the spacious eternity of the Red Centre I sweat and I struggle up steep inclines, living fully in the moment, one step at a time, totally focused on not stumbling or slipping in loose shale or being stabbed by spears of tough grass flourishing beside the track. All I hear is the steady, rhythmic crunching of dry earth beneath my boots. Work and city life pressures no longer exist. My Larapinta hike is more effective than meditation. The scale of the surroundings renders anything human as infinitesimal. I’m overwhelmed by sheer immensity in size, proportion, scale and time. The Larapinta leaves me with a lasting impression of my total insignificance in the grand scheme of things. This cosmic realisation is at once profoundly beautiful yet totally sobering.